An unfamiliar language, increases the time spent on doing routine things. 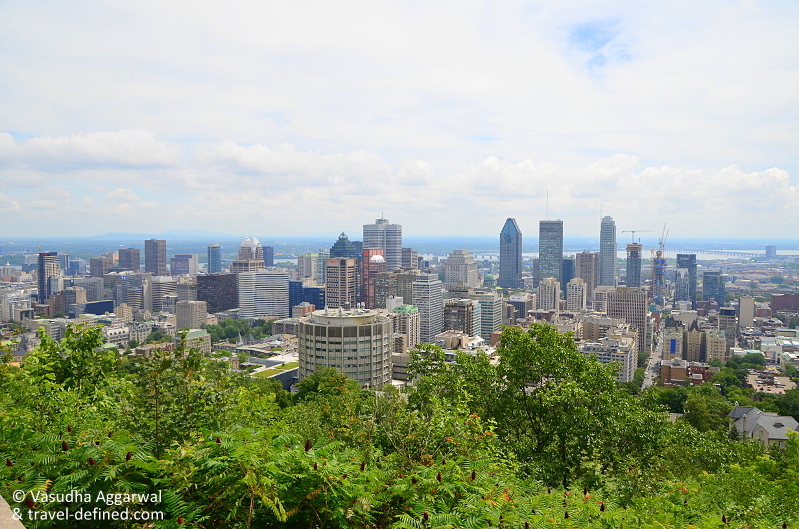 Well, we were in the city of Montreal, where 70% of the people speak french and it is also the second largest french speaking city in the world after Paris. With everything in French and not in English (as we are used to), everything took longer – from getting directions to reading a menu. Lesson learned – Before traveling, pick up more than a few words of the local language to make things easier. The trip began right from the time we settled in our car and the GPS started pronouncing the street names differently & we couldn’t figure out the directions. Our Drive from the hotel to the Mount Royal Park, though it wasn’t long, took quite some time – maybe an extra half an hour. And finally, when we found the parking lot, we were more than happy & ready for a brunch. Grabbed delicious chicken wraps from the La Pavilion Cafeteria and a slice of pecan pie and enjoyed a great view of the Beaver Lake. After fueling, we began our hike to the Lookout spot and it took us about 20 minutes to walk through the beautiful park, a few steep steps in the end and there we were on the Kondiaronk Belvedere. The Park is designed beautifully by Frederick Law Olmsted, a landscape architect who is well-known for designing New York’s fabulous Central Park. This 200-hectare park abounds with tall trees, plenty of green spaces & pathways for hiking, a lake and lots of beautiful vistas. Its a fun place for families to enjoy a Saturday afternoon grilling and throwing a ball, or hiking the trails set amidst the lush greenery. Excellent for soaking up the sun in summers, this park is ideal for spending quality time with friends and family in a natural setting. 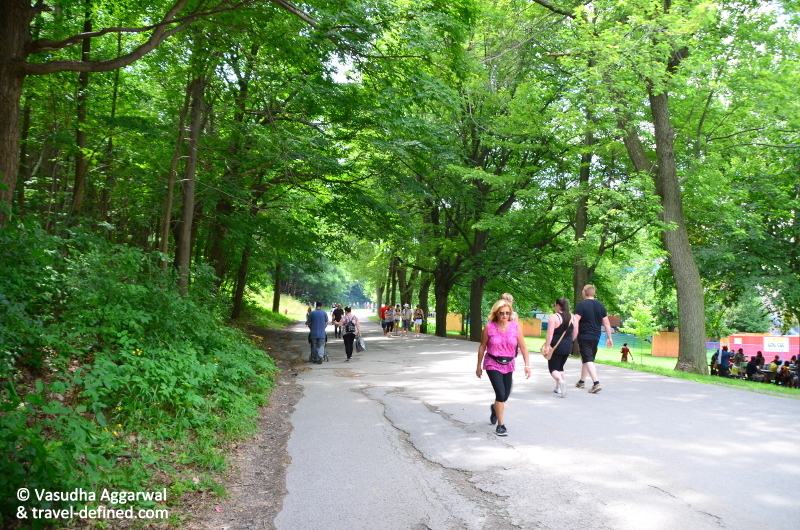 We enjoyed our walk through the park and it was the perfect beginning to our trip to Montreal. The Kondiaronk plaza overlooks a picturesque setting – the angular buildings are stacked together alongside the St Lawrence River under the never-ending blue sky. 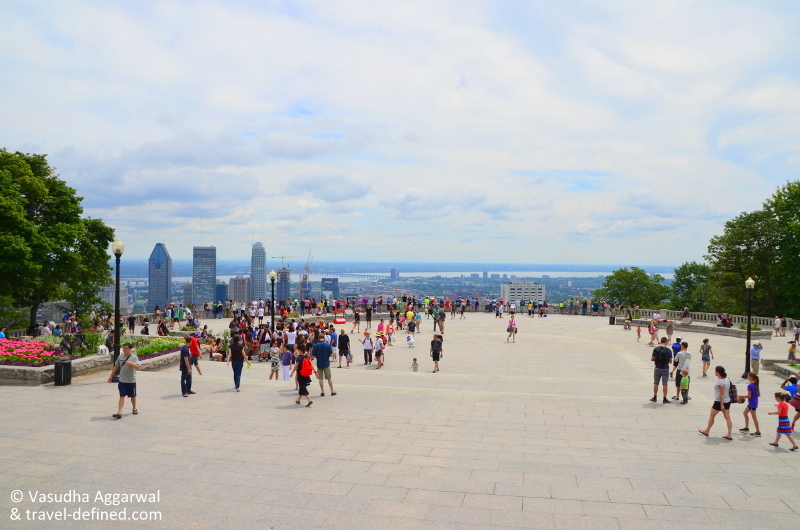 Since 1906, it has been providing the locals and the tourists – this sweeping panorama of the beautiful Montreal city. And it was abuzz with people gazing at the cityscape below, clicking pictures or just enjoying a great summer afternoon. We too found a little spot amongst it all and appreciated the beauty. Its also a great place to get a fair idea of the layout of the city. The belvedere faces the Mount Royal Chalet, which is also called – Chalet Du Mont Royal, in french. 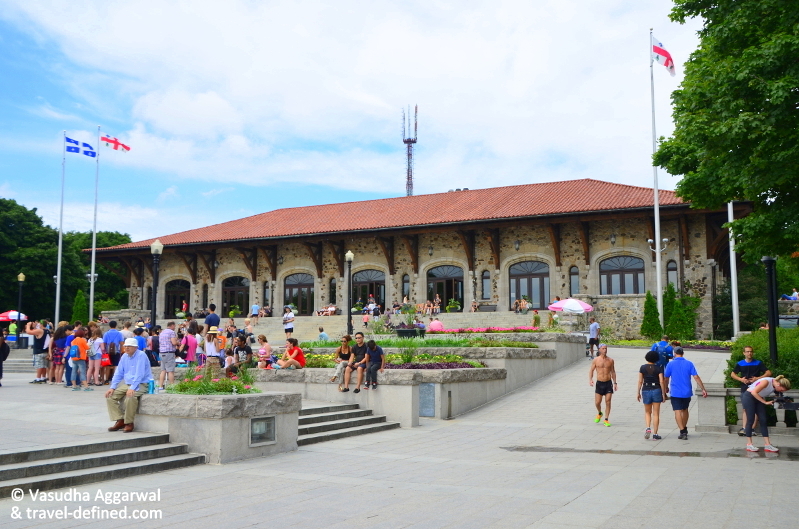 Its a beautiful stone building with a souvenir shop, vending machines, historical exhibits and seating area. The paintings displayed in the hall here, highlight Montreal’s history which were really interesting to see and we also picked up a few souvenirs from the store before making our way back to the parking. Loved spending our time in this wonderful park and enjoyed the splendid views & the lovely weather. 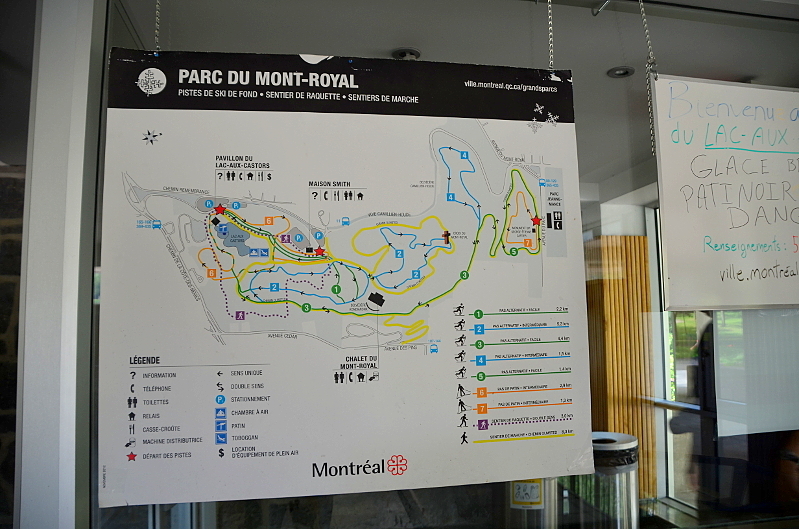 It was a great summer day at the Mont Royal. And we walked back to our car, in less time than what it took for us to reach the lookout. A picture of the Park Map (Might be helpful, if you are visiting ). Open all days of week – 6 a.m. to 12 a.m.
Yeah, it takes time to get used to it. But we did enjoy the beautiful city of Montreal. A great summer destination. Aside from the scenic beauty, which you captured with your photos, the food is pretty good too. Yeah, its a wonderful summer destination. We did try out the cafeteria near Beaver Lake and the food was pretty good. I have never spent much time in Montreal. 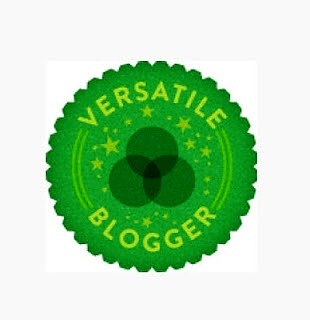 Your post makes me want to go there. Its a beautiful city and definitely a must visit. Thanks for such an interesting article, I’m going to visit Montral next week for the first time ever, this has definitely made the wait more exciting! And have a wonderful trip.